This week's weather report was 'hot'. 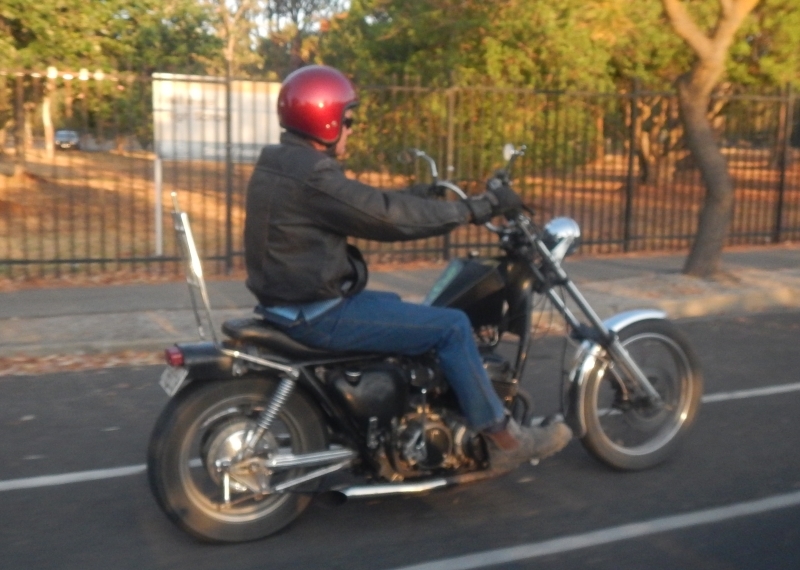 With Rob coming down from the upper north to work on his sporty chopper, I figured he would be keen on a ride. So I suggested Tuesday after work. Cyrielle and Sebastian are still here, so I offered Cyrielle my pillion seat. Didn't need to ask twice. So we decided Victor Harbor would be the shot. 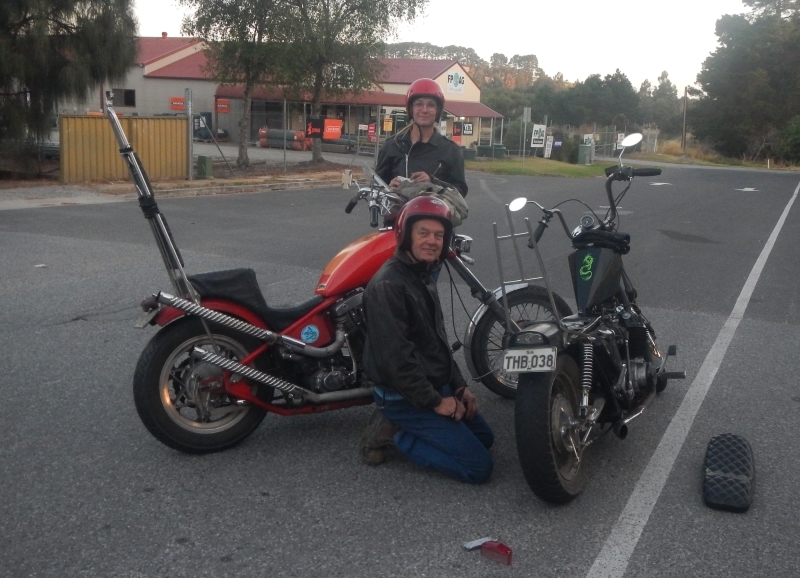 Left at 7pm, Robert on the diamond CB chopper and myself and Cyrielle on the shovel. 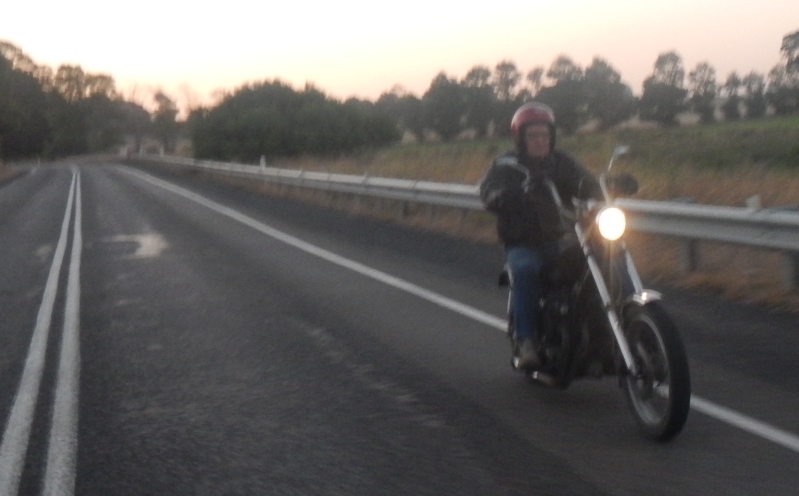 We got going in fine form with the two choppers riding close and side by side when traffic allowed. By Mt Compass light was getting dull, so we put on our lights and I noticed Rob's taillight was not on. Quick stop in the main street to check it out. 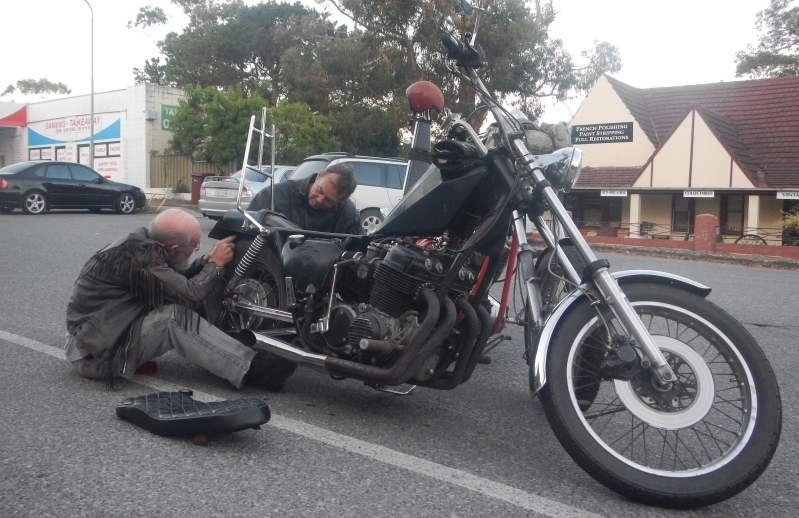 Turned out to be a wire that had dropped low enough to be hit by the tyre under hard bumps. Weather was cooler that the day before, so it was leather jacket temperature, so definitely perfect riding weather. Rob has family at Goolwa so he lead us left off the Victor Harbor road and we had a good fast ride through the twisties and then down onto the flats into Goolwa. Coming out of the hills we were surprised to see a light sea mist inland and as far as we could see. Darkness settled in for the night as we pulled into the servo and both filled up. The CB's diamond tank is only good for 70 miles max as the CB's are a thirsty motor, I get better miles per gallon on my shovel! Rob led us on a merry go round path to get to his sister's place. She and her hubby have ridden road bikes for years on long trips, but are now back to a smaller machine for local stuff. 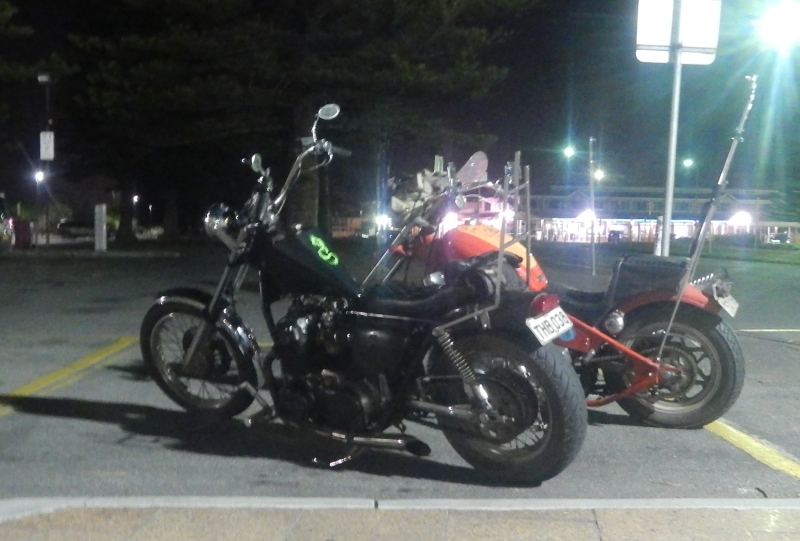 Victor Harbor was to be our next stop and it was fun to be cruising side by side through the night along a fairly deserted road. Just out of Victor the car ahead had only the left tail light working, so I accelerated and pulled up along side her motioning her to pull over... which she started to do. Rob pulled out to pass me and she panicked and took of like a bat out of hell spitting gravel in all directions. Rob was glad he wasn't pulling in front of her as he had planned to... or he would have been eating gravel! We watched in surprise as the single tail light disappeared rapidly in the distance! Toilet stop for us fellas, and then we three walked over the causeway to Granite Island. The tide was well out and we could see the bottom most of the way across. Some youngsters were cavorting in the water as we were returning. Reckoned the water was really warm and tried to convince us to jump in. Nah mates. Next time! Next stop was to be The Bluff. Haven't been there in the dark, so was a bit unsure of where the turnoff was. Followed the esplanade around Encounter Bay having a great time swooping around the roundabouts and accelerating up the straights. A man walking his dog was just what I needed. "No. We're not lost. But I don't want to be. How do we get to The Bluff?" He gave us directions and as usual, we got to talking as I thought he'd be interested that Cyrielle was from France and we were showing her around. Turns out he went to same high school as I did, two years later and knew my cousin with whom I am in regular contact! So off we blasted. Once out of the street lights it was pitch black and the sea mist was still with us. We couldn't see the bay and coastline to the west, but had a good view of the Victor and less clearly the Goolwa lights. I was getting pretty peckish by now and tried to cajole the others into a hot drink before we headed home. No luck, so off we went by the northern bypass route. A turn left not far out of Victor took us along the somewhat bumpy road to Myponga, but it was brilliant riding. The canopy of big gums over the road shining in our headlights are a favourite of mine. Makes one feel like one is not alone. Of course I wasn't, but still most enjoyable none the less. Temperature changes (one of the highlights of open face helmets) were quite frequent. 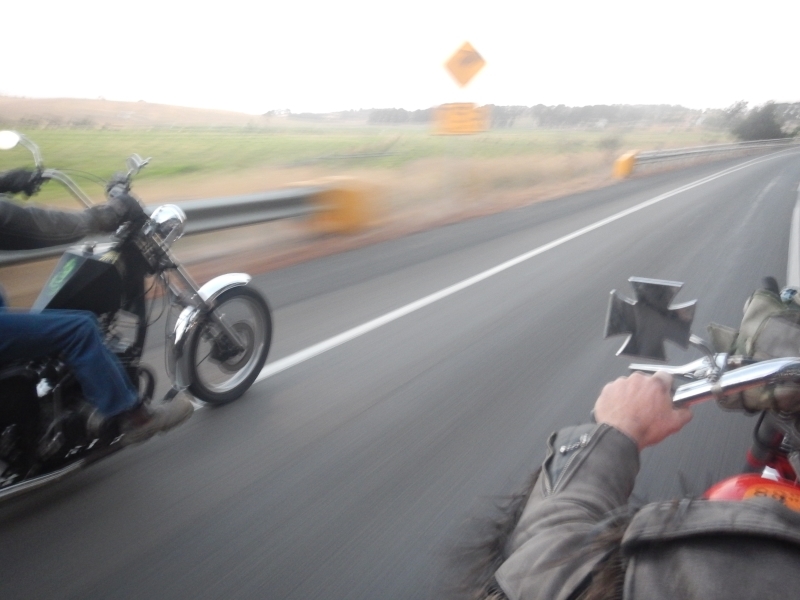 Coming onto the coast out of Myponga we were hit with strong gusts of wind that easily blew the heavy shovel from one side of the lane to the other... all part of the fun. Lights of Sellicks through to Christies Beach greeted us as well. Rolling into home around 11pm was a bit of a let down, as I could have kept riding for a lot longer with some sustenance. Asked Cyrielle how her bum stood up to the long sitting and bumpy roads. She reckoned it was sore, but that she'd loved every minute. So, a great night with our next good night ride coming up next Tuesday night... Midnight Ride.